Innovative WNST-APL-1 Winston for Apple iMac is a sit-stand workstation designed for iMac users with an Apple iMac monitor. Locking cylinder provides stability while working. Expansive workspace is large enough to hold all necessary work tools. Winston Workstation is energizing your body and inspiring your mind. 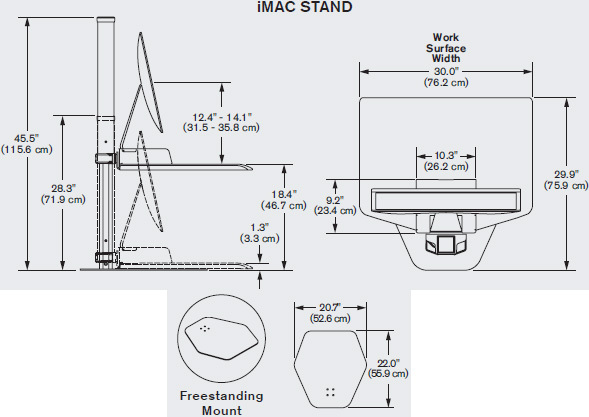 Now Apple iMac users can join the standing revolution. Winston Workstation is now compatible with the Apple iMac stand, allowing iMac devotees to take advantage of all the health benefits standing while working offers without sacrificing Apple-specific programs or the user interface that works best for them. Graphic design studios, architecture firms, and other offices using iMacs will be able to easily convert any desk into a healthy Apple iMac sit-stand workstation. Like the original Winston, Winston for Apple iMac seamlessly integrates into the day for a boost in health and wellness without disrupting workflow. The Winston Apple iMac sit-stand workstation comes with a white finish to complement the clean aesthetic of the iMac. Designed for the Apple iMac stand - Specially designed Winston features a secure space for the iMac stand. Expansive work space - Large surface allows you to bring all necessities with you when you stand. Upgrade your space - Retrofit your existing desk into a healthy workspace with two easy mounting options: freestanding or desk clamp. Seamless height adjustment - Features a 17" range of vertical height adjustment and a locking cylinder to keep the workstation in place. No manual adjustment needed. Cable management - Cable clips in the column and beam keep the cables organized and out of the way. Ethical manufacturing - Winston for Apple iMac is assembled in the USA using components created through a green manufacturing process. Works great. relatively simple to assemble. stability is more than acceptable. highly recommend.